[HOT] BMJ Best Practice accounts with only $10 for 6 months online access. We now provide BMJ Best Practice accounts (including username and password) to access online BMJ Best Practice witihin 6 months with only $10. You can use it on both your computer and your mobile device. The 6-month period (180 days) will start from the date you pay for us. After 6 months, when your account is expired, you can come back to us to buy the next period. then we will create the account for you. Step 2: Enter the amount $10. Step 5: Click “Buy Now” button, and finish the payment with your Credit Cards/Debit Cards. 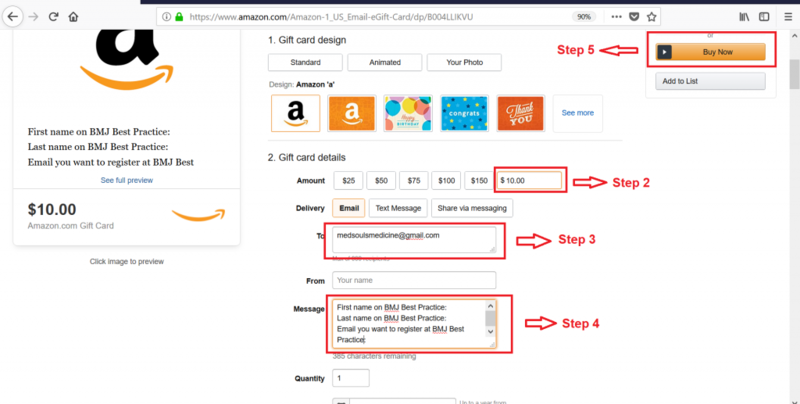 After we receive your giftcard, we will create and send you the information of your BMJ Best Practice account (username and password) via your email you write in step 4 within some hours. If you have any problems or questions, just comment below, we will reply you. Does This account works also with “BMJ learning” as well as the main site “BMJ best practice”?? It works for BMJ Best Practice only dear friend. When am buying the subscription for the second time, what do i write on the message part of the gift card?? Same as before?? Hello! I have sent the gift card for BMJ best practice. When should I expect the email with my username information? We sent the information to your account already! Please check your email. We sent the account via your email. Please check again. just now made a purchase for BMJ Best Practice.how much time will it take to get the username and password. We sent the account via your email already. Please check again. Just sent $10 your way. Kindly update me via email once you confirm the payment. Thank you! We sent the account via your mail already! Please check again your email. We sent information of account via your email. We sent information of account via your email. Please check again. We sent information of BMJ account via your email. Please check.